Lemont (population 13,098) is located in far northeastern Illinois in the southwest corner of Cook County, about 25 miles southwest of downtown Chicago on Lemont Road between Interstate Highway 55 and Illinois Route 171. The Des Plaines River and the Sanitary Drainage and Ship Canal both flow to the northwest of town. The Amtrak/Atchison, Topeka, & Sante Fe (ATSF) Railroad has tracks that travel through Lemont as well. The area in which Lemont is now located was first settled in the 1830's. Attempts to build a town in the area occurred in 1836 (Keepataw) and 1839 (Athens). However, it was the building of the Illinois & Michigan Canal in 1848 that led to the town of Lemont being created. Lemont was officially incorporated as a town in 1876. St. James Academy was Lemont's first school that offered secondary education, opening up its doors in 1884. A two-story building made with local limestone was erected for the purpose of housing the classrooms. St. James was cared for by St. Patrick's Parish in the community, which also led to the school also being referred to as St. Patrick's by the Diocese of Chicago at the time. 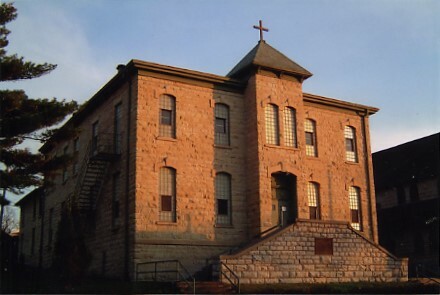 The Dominican Sisters of Sinsinawa, WI were in charge of the school, which graduated its first class in 1893. In 1896, the Rev. Michael O'Sullivan opened a commercial department of the school, and enrollment grew within the year. Those students had their first graduation in 1898 at the Teden Opera house with Circuit Judge John J. Gibbons handing out diplomas to those students. Even though the enrollment had another jump in 1899, it is believed that the commercial department closed in 1900 when Rev. O'Sullivan was transferred to St. Bridget's Parish in Chicago, but we are uncertain if the academic department followed suit. The building remains standing in Lemont today, even as students from St. Patrick now attend school with students from St. Alphonsus Parish. We'd like to offer thanks to the folks at the Lemont Area Historical Society for some of the information & photo from Richard Lee that are listed on this page about St. James' history, as well as the 1953 dissertation on Catholic secondary education in the Archdiocese of Chicago by St. Mary Innocenta Montay.